Gardens of Cultural Property | Hanatoyo Landscape Co.,Ltd. Throughout the nearly 150 years of service, HANATOYO Landscape Co., Ltd. has been striving for the best gardening skills and taking special care of their preservation and succession. Becoming the national capital in 794 B.C., Kyoto has a historical reason to be the heart of Japanese culture. 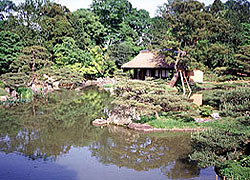 Leaders and the influential were keen to develop their gardens as the symbol of power and wealth as well as cultural vocabulary. Geographical conditions further helped the gardening culture flourish here; Embraced by hills and mountains on three sides, the city was blessed with streams of waters and with wide variety of natural garden materials like stones, rocks and vegetation. 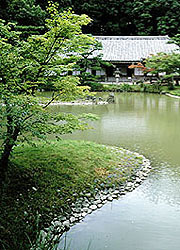 Kyoto today sees numbers of age-old gardens and continues to discover them by excavation. In every aspect of restoring and conserving these cultural heritages, our inherited skills and techniques are in use. We believe our mission is to pass these skills and experiences down to the generations, which is vital to bequeath the legacy of Japanese gardens. 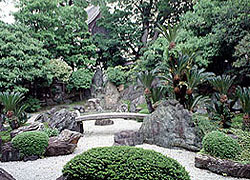 As an active member of the Association of Engineers for Conservation of Cultural Property Gardens (designated by the Ministry of Education, Culture, Sports, Science and Technology,) we are involved in maintaining the specialized skills for the conservation of the gardens registered as Cultural Properties in Japan.